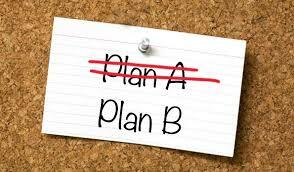 When it comes to setting organizational and personal goals, making a backup plan has been seen as a sensible way to deal with uncertainty -- to be prepared if things don't go as expected. However, new research challenges that conventional wisdom. When it comes to setting organizational and personal goals, making a backup plan has been seen as a sensible way to deal with uncertainty -- to be prepared if things don't go as expected. "I was talking with Katy about how sometimes I was hesitant to make a backup plan, because somehow I thought it might hurt my chances of success in my primary goal," Shin says. "Katy thought it was an interesting idea and we decided to test it." Some groups were then instructed to come up with other ways they could get free food on campus or save time later in the day in case they didn't do well enough to earn the snack or the early dismissal in their current study. Those in the groups making backup plans showed lower performance on the task, and a follow-up experiment revealed a key factor driving this effect was a diminished desire for goal success. The researchers suggest that while they find potential costs to making a backup plan, it does not mean that people should go through life without ever having them. They say you could explore ways to mitigate these costs -- such as being more strategic about when you make a backup plan. "You might want to wait until you have done everything you can to achieve your primary goal first," Shin says.